It’d be easy to label Microsoft’s E3 2012 conference as yet another paean to virtual warfare with its loud trailers for Call of Duty: Black Ops 2, Splinter Cell: Blacklisted, and Tomb Raider, but the real conflict at the heart of the Windows company’s corporate strategy for the next twelve months is the war for living room entertainment. Its grand strategy for controlling consumers’ media time was three-pronged: More television services, Internet Explorer on the Xbox 360, and Xbox Music. 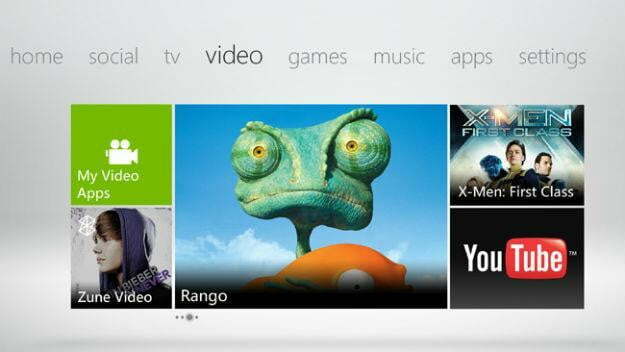 Microsoft’s television programming expansion wasn’t quite as far reaching as rumors suggested. Rather than a devoted cable service, the company kept it slow and steady. New Spanish language programming with a Univision partnership and a channel for the cultishly adored Machinima demonstrated the breadth of Microsoft’s audience targeting. It also strengthened its existing partnership with Viacom, announcing a Nickelodeon channel. These were in addition to a blitz of new sports content, including the NBA Game Time League Pass channel, NHL Game Center, and the announcement of 24-hour live content from ESPN, ESPN U, and ESPN 3. Much asked for content like Monday Night Football was shown, but Microsoft offered no concrete details on pricing. Will these channels be premium extras like Netflix and HBO Go or perks for Xbox Live Gold subscribers? As suspected, Microsoft did announce an Xbox version of its Internet Explorer web browser, a seemingly speedy television web browser that allows for navigation via Kinect voice commands and the new tablet and smartphone Xbox Smart Glass app. Scrolling through websites via a handheld device and through easy voice commands seems to fix the common problem associated with console browsers, namely the awkwardness of using a remote or game controller to browse. Stylish as it seems, Xbox Internet Explorer demonstrates just how expensive using the full array of Microsoft services on Xbox is becoming. For wealthy users that already own connected handhelds and the console, it’s a quality service, but its questionable how many people in Microsoft’s audience will be able to take full advantage. Also previously rumored was Xbox Music, the company’s revamped version of the Zune Marketplace and a potential competitor for Spotify. Previously known as Woodstock, Microsoft offered zero concrete details about the service and how it would distinguish itself outside of a change in brand name. No doubt we’ll hear more as the week goes on, but for now keep this lesson in mind: If it looks like Zune and sounds like Zune, it’s likely still just Zune.